The fact of the matter is that deflation and inflation are NOT mutually exclusive. Forget all the clever arguments for a moment and look at the world around you. Housing prices and incomes are falling. Employment and the average work-week are down while industrial capacity has considerable slack. Those are DE-flationary items. However, at the same time, food prices and the cost of many goods are RISING. In general the cost of living is going UP. Ditto for quite a few commodities: oil is up nearly 30% year over year while Gold has risen 20%. And don’t even get me started about grain prices in the last few months. These are IN-flationary items. In plain terms, BOTH inflation and deflation are occurring simultaneously. To argue otherwise is to ignore what’s taking place right in front of you or to choose opinion over fact. The world, in general, is far more complicated that people give it credit for. And these binary arguments (something can ONLY be either A or B, but not both or a shade of gray) are foolish and misguided. They’ve also lost people a lot of money. 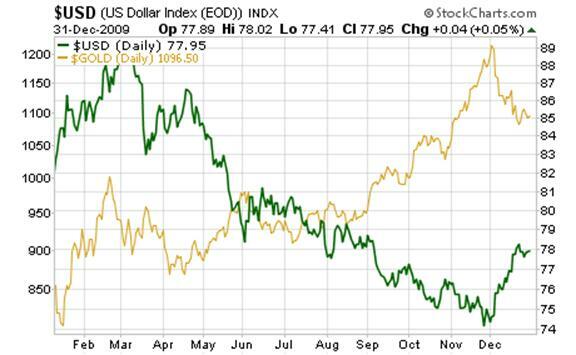 As you can see, BOTH the US Dollar and Gold have rallied during this time. 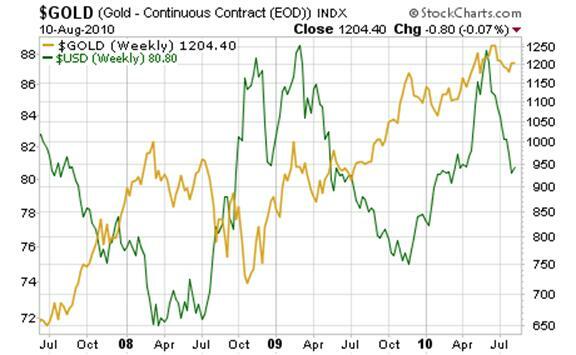 On a relative basis Gold has outperformed (20% vs. the Dollar’s 12%), but we have not been in a world in which one asset exploded higher while the other collapsed. Which brings me to my next point: the financial world is not an “all or nothing” place, it is a place of relatives and relationships. And those who choose to become fixated on one outcome or mind-set will ultimately find they lose money because of their convictions. Case in point, the inflationists who bet big on the “Gold will explode because the Dollar is doomed from all the bailouts” thesis in 2008 got take to the cleaners when the exact opposite happened and Gold fell from $900 to below $750 while the Dollar rallied to multi-year highs in a matter of months. Similarly, the “Dollar will rise and Gold is doomed because there’s too much debt” deflationists got taken to the cleaners for most of 2009 and early 2010 as stocks put in a 60% rally and the Dollar came within a few percentage points of its 20 year low. To return to my primary point: the financial world is relative. The various asset classes, whether they be stocks, bonds, currencies, or commodities, move in relation to one another. This is ESPECIALLY true in today’s highly correlated market dominated by computer trading and the Fed and other central banks’ “funny money” policies. All investors need to account for this fact and act accordingly. This means shifting your investment focus from emphasizing one “ation” (inflation or deflation) or one asset class (stocks, bonds, etc) to another depending on what’s going on in the markets. This is not particularly hard to do. If you’re a passive investor who doesn’t actively trade the markets, then focus on the weekly charts and investor sentiment to determine when it’s time to shift capital. Whenever things get tilted too heavily to one side, it’s a good time to start shifting to the opposite camp. 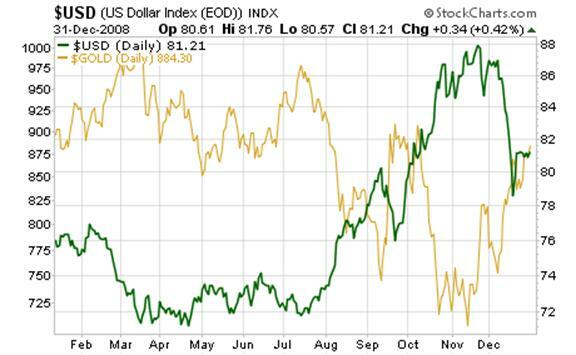 For example, back in November only 3% of investors were bullish on the US Dollar. 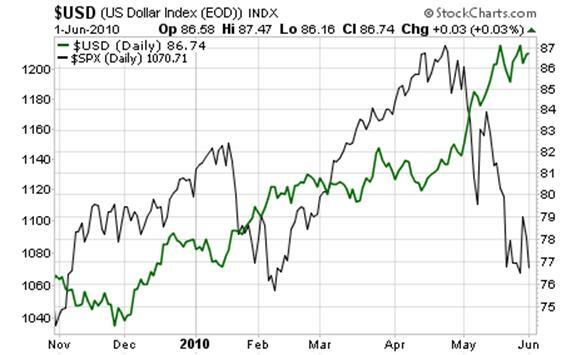 Given this sentiment and the fact that the Dollar was down for nearly 9 months and approaching a 20-year low while stocks had rallied, the “anti-Dollar” trade was extremely lopsided. The odds favored a Dollar rally and so it would have been a good time to shift from anti-Dollar hedges to pro-Dollar investments. Indeed, if you’d shifted to cash then and waited until sentiment became lopsided again in June 2010 (at that time 98% of investors were bullish on the US Dollar) you would have seen a nice 12% gain from your move. I don’t know about you, but a 12% gain in seven months from a single decision strikes me as a decent return for little effort. Not to mention the peace of mind of not sitting through stocks’ AWFUL volatility in 1Q10 and 2Q10. To most passive investors, that kind of peace of mind is priceless. Bear in mind, I’m talking about general portfolio allocation for passive investors here, NOT active traders. However, if you’re an active trader who spends most of your time in front of the computer playing the market, markets like the one we have today couldn’t be more profitable. With volatility increasing and price swings becoming more extreme between assets classes the potential to produce outsized profits has increased dramatically provided you’re willing to “get in and get out” quickly.